"Records are made to be broken" surely applies to Pete Wilson, a New York native who moved to Fresno at the age of 43, and began his conquest of powerlifting at age 49. At the time of his induction, Wilson had won six (6) World Championships, seven (7) American Championships and twenty (20) California State Championships since taking up the sport in 1986. Among his many other accomplishments would be the 2008 Induction into the U.S. Powerlifting Federation Hall of Fame and a citation in Sports Illustrated magazine's popular "Faces in the Crowd" feature in 1998. Three lifts comprise a powerlifting completion - squat, bench press and deadlift - and Wilson excelled at all of them. In addition, he performed at a high level for nearly three decades in a sport in which competitors often rise to prominence and quickly burn out. At 5 feet, 6 inches tall, Wilson competed in the 181-, 198- and 220-pound classes in both Masters and open competitions. In 1988, at the age of 51, he pulled the best deadlift of his career, 518 lbs. He was 55 when he squatted a career-best 525 lbs., and 61 when he produced his career-best bench press of 374.7 lbs. Wilson's all-time best total for the three lifts of 1,387 lbs. was accomplished at the 1997 U.S. Powerlifting Federation National Championships, when he was 60, in Portland, Oregon. Wilson grew up in the borough of Manhattan in New York City and ran track and played basketball while attending Straubenmueller Textile High School in Manhattan. It was Wilson's wife, Deidra, who convinced him to join a gym here in Fresno. After attending a powerlifting meet, Wilson says, "I liked what I saw" and he started training to compete in an upcoming competition." Wison's career took him to locales such as Australia, Finland, Canada and all over the United States for competitions. 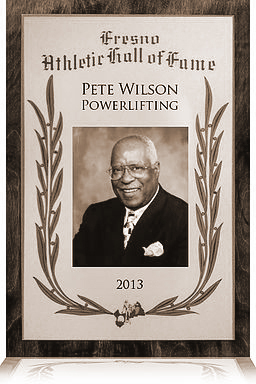 It also earned him the nickname "The Governor of Powerlifting," because Pete Wilson occupied the state Capitol while the powerlifter was setting records.